Beautiful. Hugs, purrs and head bonks. I'm glad Truffles has come home once again. Piper is home as well, next to her friend and adopted mom, Agnes. Love and blessings for your hurting heart. Sending you BIG purrs and head bumps. We are glad Truffles is home with you again. We are sending purrs and love to you. Beautiful! Purrs to you both. Hugs and purrs to you, Melissa. Bringing the ashes home has always felt bittersweet to me. In one way, it does feel like a homecoming, but in another way, it just rips your heart open all over again. Wes sending lots of love and strength. Awe Hugs and Licky Kisses! I'm glad Truffles is home with you again. Sending and hugs and purrs! That painting is beautiful, just like Truffles. I like the paw print too. The pic tears us up. Did you get a gold plated name badge for the box like we did for Autumn? 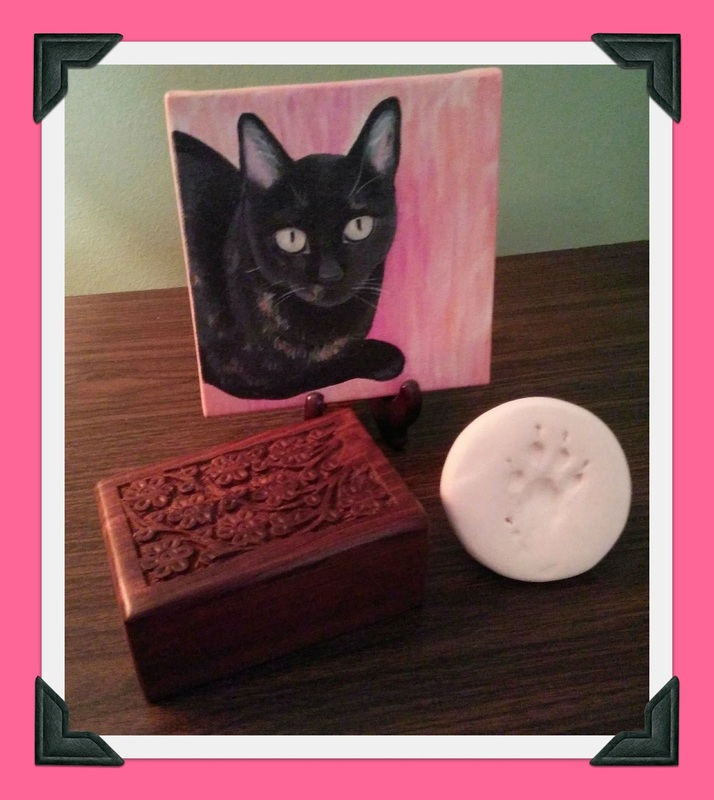 It took me 6 months before I could open Abby's box and look at her ashes. I was so surprised at how few there were. Now she and Gracie rest at the head of my bed on the nightstand. I hope you got a locket of Truffles fur too. I still to this day take Abby's out and touch it and it's her. I know if someone else were to find these small pieces of fur I have they would throw them out but they are some of the most precious things I have. I have whiskers and tuffs of fur combined together but both Gracie and Abby have their fur in a separated bag. may this bring you some peace and some closure. The love we have never leaves, and when they are no longer there to give it to directly it hurts so much, but in time your body learns to give love to the spirit, and it eases.. Purrs of healing and comfort. What a beautiful tribute to sweet Truffles, Melissa. We are glad she is home with you, and we know that her spirit and love live on forever in your heart. Sending you hugs, purrs and prayers. It's a beautiful tribute to a beautiful life. I've been thinking about you a lot and how you are doing. It's nice that you are still on FB and liking Dolly's photos we really appreciate it. Sendin' hugs, purrs and purrayers. Tearing up, over here. Those small boxes just don't seem big enough to hold all of the memories we have of our cats, and all of the pain we feel when they're gone. Thinking of you at this sad time. What a beaitiful picture of Truffles. She will always be near when you miss her. Hugs & prayers...from our home to you. It is good to have Truffles home - sending you gentle hugs and purrs.